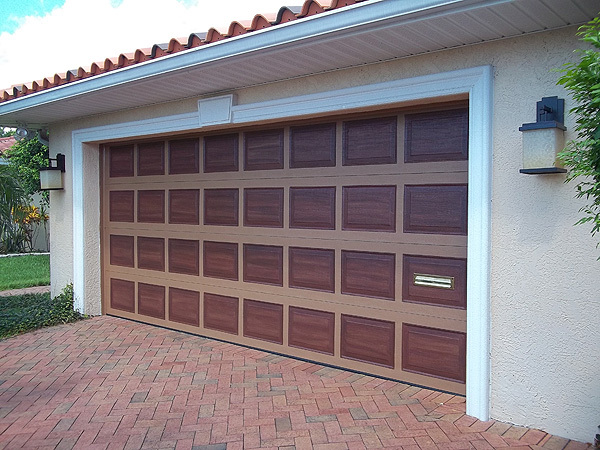 I have been working on a double garage door and double front door with sidelights in St. Petersburg. 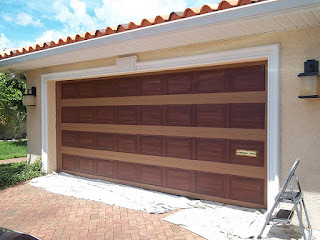 I am painting the garage door and front doors to look like wood. The big challenge here was to strip the front doors down. They are made of fiberglass and the paint was peeling off. 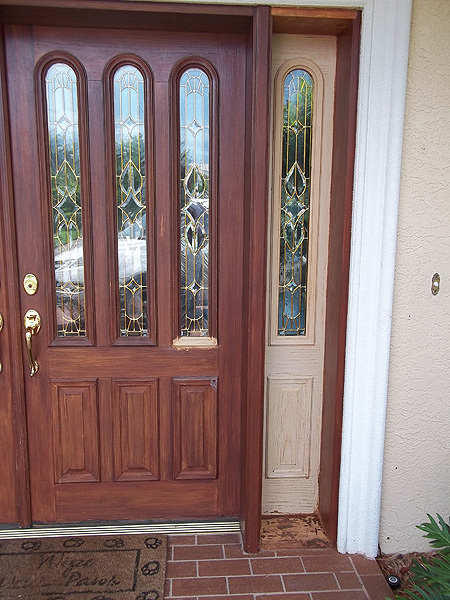 There was several layers of paint on the doors. I used a product called SmartStrip which I got from Sherwin Williams. It worked great. Very environmently friendly, does not smell and you can use it with your bare hands. You paint the stuff on and let it sit. After about 30 minutes I scrapped off what had wrinkled up and applied another coat. That wrinkled up and I scrapped that up then did it again. It took 3 applications to get it down to the bare fiberglass. It says on the can to let it set for 3 hours to 24 hours but I only let it set for 30 minutes at a time and it worked great but I had to do multiple applications. After I got all the paint off I clean the residue with Krud Kutter and paper towels. The Krud Kutter took off any residual residue of the smartstrip and the doors were perfectly clean and ready to prime. I primed with Stix primer and then basecoated the doors with a Sherwin williams color called Toasty. 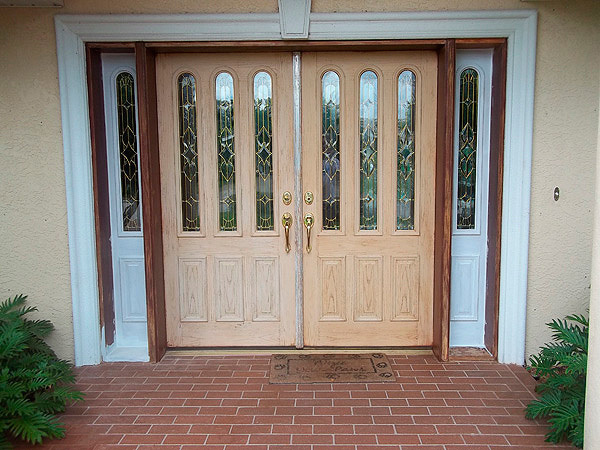 This next picture shows the door completely stripped and the sidelights primed. The wood frame was not stripped to barewood all over but sanded real good. In some spots it did get sanded down to the bare wood. 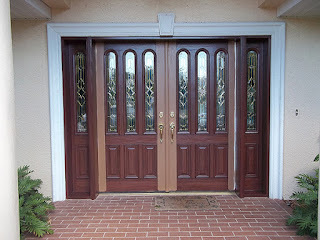 This next photo shows the doors done except for the perimeter. The clients are out of town and the doors open in so I have to wait for them to get back. That way I can open the doors and paint the edges, etc. 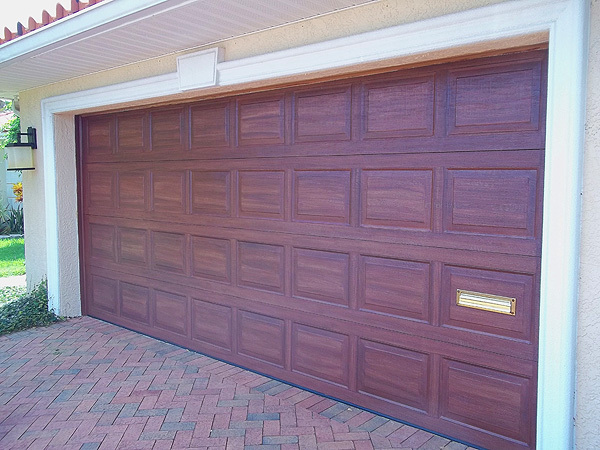 The garage door was done to match the front door. In this photo it shows how the center panels are complete. Again I used the SW Toasty as a basecoat color. Then I used a SW color Fiery Brown for the first coat of wood grain. 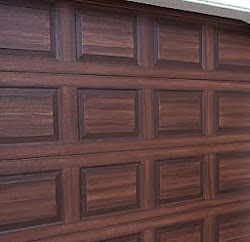 The second coat of wood grain was a combination of Fiery Brown and black. I always use at least 2 colors for the wood graining part. When I paint a garage door I think its very important to do what I can to create the effect of real wood. 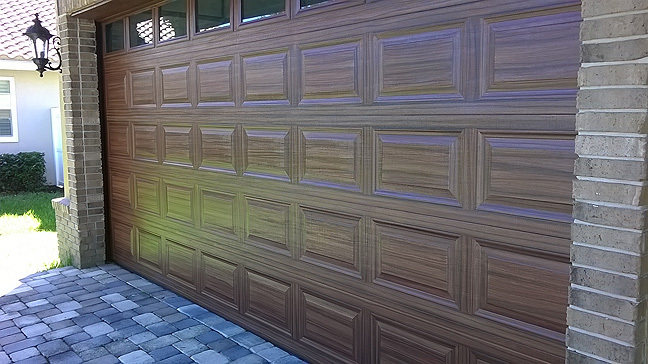 So in the next photo you can see how I painted in the wood grain pattern on the vertical areas between the center panels. If this were real wood those vertical areas would have a vertical wood grain pattern. Hey! I love the new garage door!